Richard Edgar-Wilson Tenor, Coull Quartet. ** Premier recordings** The King of The Golden River (Rodgers)**O Mistress mine (Bax)**My Eyes for Beauty pine (Bax) Amoretti Second Series, Op.43 (Rubbra)**Ave Maria Gratia Plena - Two Mediaeval Songs (Rubbra)On Wenlock Edge (Vaughan Williams). Music for Tenor and String Quartet. 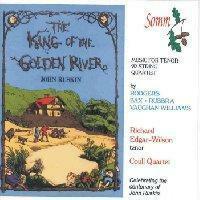 Sarah Rodgers: The King of The Golden River, Rubbra: Amoretti, Two Mediaeval Songs, Bax: O Mistress Mine, My Eyes for Beauty pine, Vaughan Williams: On Wenlock Edge. Richard Edgar-Wilson, Coull Quartet. With her setting of The King of The Golden River, composer Sarah Rodgers pays affectionate tribute to Victorian writer John Ruskin whose centenary falls in the year 2000. The disc also includes other premier recordings of songs by Bax and Rubbra as well as Vaughan Williams's immortal On Wenlock Edge. What do you want to know about Music for Tenor and String Quartet?